The preliminaries for all Division II (*) track events will be held on Friday June 2 starting with Colin McCullough in the 110-meter hurdles at 2:10 pm and conclude with the Galion boys 4×400-meter relay prelims at 4:10 pm. Preliminaries and finals for Marisa Gwinner in the girls high jump will take place on Friday morning beginning at 9:30 am. If the Galion runners are to qualify for the finals, the boys 110-hurdles will start Satruday June 3 off at 1:05 pm and conclude with the 4×400 at 3:15 pm. In the Division III (**) prelims, the Mount Gilead boys 4×800 team will be kicking things off at 9:45 am and the track qualifying will conclude at 12:10 pm when the Mount Gilead and Northmor boys 4×400 teams race to qualify for Saturday’s finals. Please note that the 4×800-relay is finals only and no preliminaries. All field events for Division III will take place on Friday and start at 1 pm with James Walker of Northmor in the high jump and conclude with Meechie Johnson, also of Northmor, in the boys long jump. The long jump prelims are set to begin at 4 pm. Saturday’s action for Northmor, Colonel Crawford and Mount Gilead is set to start at 9:35 am with the 110-hurdles finals. Chad Johnson and Brad Bauer (***) are the only boys qualifiers for Colonel Crawford. The 3200-meter run does not have preliminaries and finals are set to begin in this event at 11:25 am on Saturday. 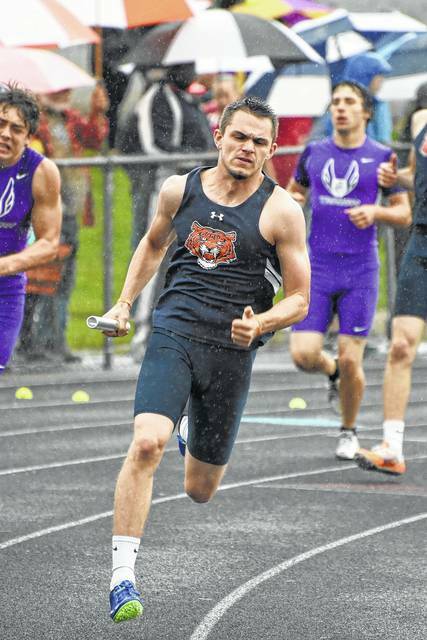 Chad Clinger | Galion Inquirer Harrison Ivy finished in fourth place in the 400-meter dash at the regional meet in Lexington to qualify for the state meet this week. Ivy will also be competing in the 4×200 and 4×400-meter relay events for Galion. http://aimmedianetwork.com/wp-content/uploads/sites/38/2017/05/web1_H-in-the-400-1.jpgChad Clinger | Galion Inquirer Harrison Ivy finished in fourth place in the 400-meter dash at the regional meet in Lexington to qualify for the state meet this week. Ivy will also be competing in the 4×200 and 4×400-meter relay events for Galion.